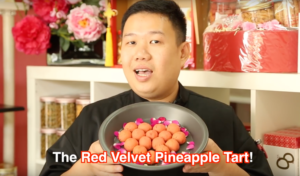 Home Food YiKouWei: Red Velvet… PINEAPPLE TARTS?! The dilemma of choosing a perfect gift for someone is something that everyone suffers. Boyfriends often result in falling into clichés, like flowers, chocolate, or cards. You should be getting your special someone something unique. You should even include a local twist. 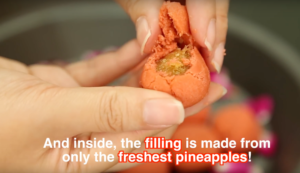 This is what expert baker Amos had in mind when he created his Red Velvet Pineapple Tarts! Red Velvet Pineapple Tarts: Baking with Love! The Red Velvet Pineapple Tart’s idea was conceived by Amos when he was thinking of a special gift for his girlfriend. Therefore he decided to create this unique twist of a Chinese New Year favorite. He braved through months of intensive R&D in which he revised his recipe 50 times before he was satisfied! Now that’s a dedicated boyfriend. Amos used an all-natural ingredient to create the red crust. That being beetroot juice! The crust is also infused with hints of dark chocolate. And what about the delicious iconic Pineapple tart filling? It is because it is made with the freshest Pineapples available! Needless to say, the Red Velvet Pineapple Tarts won her taste buds, and as a result her heart! You can buy the Red Velvet Pineapple Tart, at Yi Kou Wei. Serious Foodies know of this storied bakery. Established in 1983, Yi Kou Wei is known for their local famous freshly hand-made Springroll “Popiah” in their early years. Most noteworthily they took pride in devoting the business to promoting Home-made Traditional Chinese pastries. Slowly over the years, they have built up a reputation for selling unique traditional New Year cookies. So get your money ready because Amos’s Red Velvet Pineapple Tart is definitely one of them. Love this episode? Check out all the other Foodie Minute episodes! Catch our latest updates on our social media! Love our content? Support our work on Patreon! Next articleThe Beautiful Dolomites! : 4 Views that you have to see!